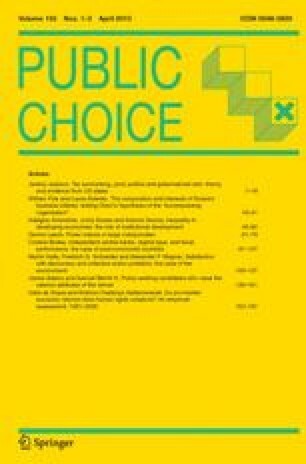 In this paper, we consider thesentences of constitutional illegitimacy bythe Italian Constitutional Court in theFirst Republic (1956–1992) as a measure ofits independence from politicians. We focuson the Court's incidental review and testwhether the Court's independence increaseswhen there is more policy stability, namelywhen politicians are less able to changethe policy status quo by legislation. Wefollow Tsebelis (2002) in assuming thatlegislative policy change is less likelywhen either the number and/or ideologicaldistance of veto players increases. As aproxy for the size of the veto players'Pareto set, we use either the number ofparties in government, or the number ofparties forming a constitutional majorityin Parliament, or the number of effectiveparties in Parliament, or measures ofideological distance based on Laver andHunt (1992). By controlling for the Court'sdegree of internal cohesion, cointegrationanalysis shows that there is a stable andpositive long-run relationship between theCourt's independence and proxy measures ofthe degree of policy stability.